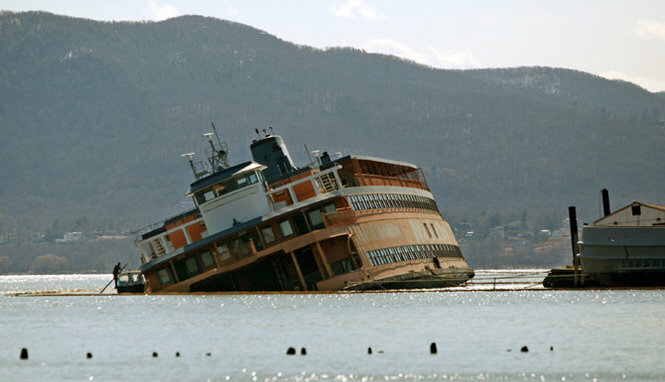 The former 300 foot long Staten Island ferry Governor Herbert H. Lehman partially sank on the Hudson River near Newburgh, New York. The vessel sprung a leak and sank to the bottom of the river. Authorities placed an oil boom to contain the small amounts of pollution released. No reports of injuries. The ferry built in 1965 was decommissioned in 2007 and had changed hands several times with the last owner planning to turn the vessel into a floating restaurant. It is now slated to be raised and later scrapped.